The future has arrived in the Philippines with the launch of digitalcitiesPH. The aim of the program is to enhance and further expand the development of Information and Communications Technology (ICT) Councils all throughout the country that will foster economic development particularly in the regions outside the National Capital Region (NCR). The program is spearheaded by the Department of Information and Communications Technology (DICT) together with the National ICT Confederation of the Philippines (NICP), the umbrella organization of information and communications technology (ICT) Councils across the country, and the Information Technology and Business Process Association of the Philippines (IBPAP). 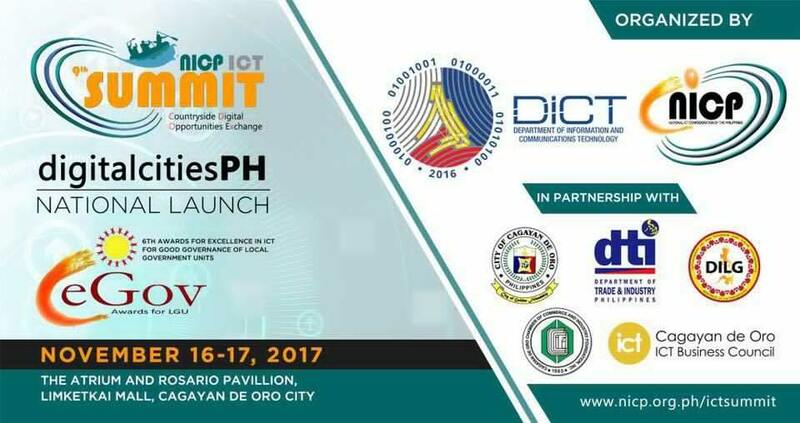 It was launched last November 2017 at the 9th NICP ICT Summit held in Cagayan de Oro City. Before digitalcitiesPH, the then Information and Communications Technology Office (ICTO) under the Department of Science and Technology (DOST) vigorously pursued the Next Wave Cities Initiative wherein regional hubs were identified in expanding and stimulating the economic potentials of these cities in the regions. These cities were envisioned to be hubs that will be the business and innovation centers as well as investment targets outside the NCR. These hubs will, in turn, be the foci of economic development and opportunities in the countryside. The digitalcitiesPH Program is the beefed up version of the New Wave Cities Initiative. The goals are based on the IT-BPM Roadmap and the Tholons 100 Services Globalization Index. “The digital landscape is fast changing. We see it as an opportunity to level up our programs that will ensure our country’s global competitiveness. We will continue to capacitate and empower every city through ICT to push our country forward,” according to Undersecretary Monchito B. Ibrahim. Currently, five cities in the country are included in the Top 100 Supercities of the Tholons 100 Rankings. These are Manila, Cebu, Davao, Bacolod, and Sta. Rosa, Laguna. Being a digitalcitiesPH means not only economic opportunities but also IT-enabled programs in infrastructure, governance, livelihood and education development for all cities in the country since it is intended for all cities and municipalities of the country. The launch of digitalcitiesPH was participated in by 700 stakeholders and experts from the public and private sectors to share industry trends, developments, best practices, and identify challenges and ways to generate new investments, achieve digital transformation, spur innovations and create jobs especially in the countryside.